When "Black is Black" hit the airwaves in the summer of 1966, many people assumed it was a new single by Gene Pitney. The song's lead singer, Mike Kogel, sounded so much like Gene that it was confusing to hear radio deejays throw out the words Los Bravos when the song played...like, why wasn't Pitney mentioned? Then again, the song's arrangement was quite a bit different from anything he had done up to that point; it just took us all a little time to get used to the Los Bravos sound. Earlier on, guitarist Antonio Martinez, organist Manolo Fernandez, bassist Miguel Vicens and drummer Pablo Sanheli were in the group Los Sonor. In 1965, the four musicians from Madrid started Los Bravos with Kogel, from West Berlin, Germany, to front the band as lead vocalist. The initial plan was to reach beyond their respective countries and make a name for the group throughout Europe. Signing a contract with Decca Records of Spain, they were able to connect with Ivor Raymonde at the parent company's headquarters in London. Raymonde was a hot producer and arranger with many hits under his belt by early-'60s British stars including Marty Wilde, Billy Fury and The Springfields. More recently, he'd been at the controls for The Walker Brothers' "The Sun Ain't Gonna Shine (Anymore)" and Dusty Springfield's "You Don't Have to Say You Love Me," both number one U.K. hits in April 1966, the same month he produced the debut single by Los Bravos. That single, "Black is Black," written by Tony Hayes, Steve Wadey and Michelle Grainger, performed far beryond the band's expectations. Debuting on the charts in England at the end of June, it reached the number two spot by the end of July. Then came the big push in the U.S., but it wasn't a hard sell. The single, on London Records' subsidiary label Press, appeared in early August and was top ten by the end of September. The five Bravos boys followed with a top 20 British hit in October, "I Don't Care" (written by Raymonde with Tony Clarke, best known as the The Moody Blues' longtime producer), while the American label went with "Going Nowhere" (by American composers Estelle Levitt and Ruth Sexter), which nearly ended up as the title suggested, making a brief showing near the bottom of the charts in December. The group's popularity back home didn't suffer, though; in 1967, they starred in Los Chicos Con Las Chicas (The Boys with the Girls), a slapstick-comedy-and-music film inspired at least in part by the astounding success (even overseas) of The Monkees. The movie premiered in September and, although successful in Spain, it wasn't released internationally except in Mexico a few years later. For Los Bravos, unfortunately, the thrill of becoming movie stars was dampened considerably by the death in May of Manolo Fernandez. After filming had wrapped for Los Chicos, while the guys were in the process of making a second movie to be released the following year, the keyboard player's wife died in an automobile accident; grief-stricken, Fernandez committed suicide a short time afterwards. He was replaced in the lineup by Peter Solley. Alain Milhaud, the band's manager, took over as producer for the sessions that resulted in the energetic "Bring a Little Lovin'," putting Los Bravos back on the charts, in America at least, during the spring of 1968. Harry Vanda and George Young of Australian band The Easybeats (those "Friday on My Mind" guys) wrote the song, used as the title track for the second movie, titled Dame Un Poco De Amooor! 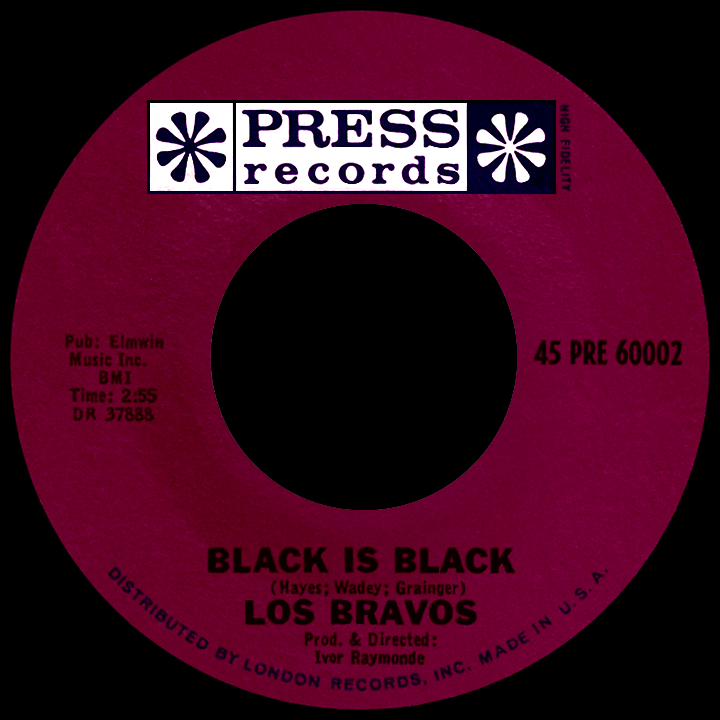 in Spain, identified on the Parrot label U.S. single as Bravos II and translated for release (the song, not the film) in English-speaking countries. 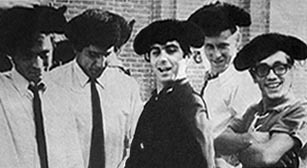 All five original members, including Fernandez, appeared onscreen. The band continued recording for several months and released at least one other record, but Manolo's death affected momentum and they broke up in 1969. 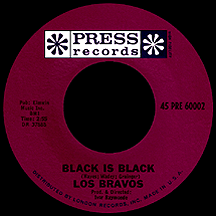 Los Bravos was a rarity, as very few acts from Spain had scored big on the U.S. music charts prior to their arrival. Xavier Cugat is about the only other Spanish artist with American hits that comes to mind, in addition to later appearances by Los Pop Tops, a band from Madrid who charted with "Oh Lord, Why Lord" in 1968 and "Mammy Blue" in '71 and Miguel Rios of Granada, who hit big in '70 with "A Song of Joy." Mike Kogel kept going as a solo act, recording under the name Mike Kennedy after leaving the band. He hit the U.S. charts in March 1972 with "Louisianna," written by Fernando Arbex of the Spanish group Los Brincos, so popular in the mid-'60s that they were nicknamed "The Spanish Beatles" (Arbex had a fling with success in America when his song "Hijack" became a hit for jazz flutist Herbie Mann in 1975 and royalty payments kept rolling in years later when the song's hook was sampled on hit singles by The Beatnuts and Jennifer Lopez). By the way, Kogel's vocals on "Louisianna," as you might have suspected, still kinda had that Pitney sound.